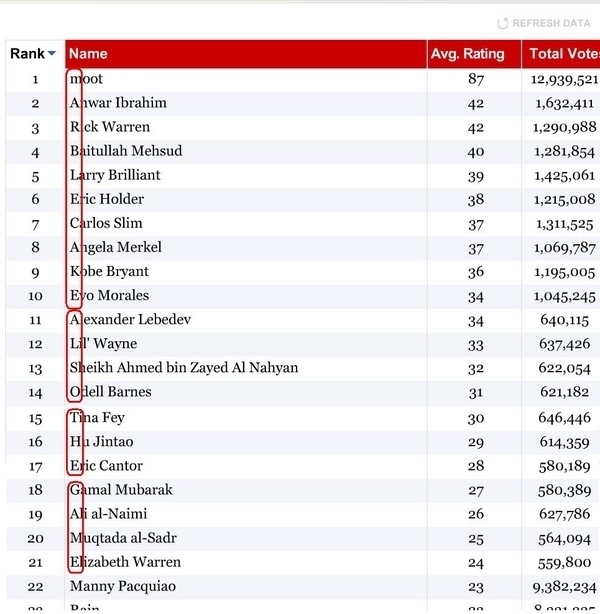 The hackers of 4Chan have succeeded in completely gaming Time Magazine’s online poll for its Time 100 list of the most influential people on the planet. At the top of the list is Christopher Poole, aka Moot, the founder of the 4Chan online forum, whose members used some coding to get his name to the top of the list. Not only did they help moot win the poll, but they also arranged the next 20 names to spell out “Marblecake, also the game.” Marblecake is a lewd sexual reference, but is also supposedly the name of the chat room where one of 4Chan’s online collective actions, Project Chanology, originated. Moot denies knowing about any concerted plan by his followers to influence the poll, though TIME.com’s technical team did detect and extinguish several attempts to hack the vote. Except Time.com’s technical team didn’t do a very good job, because the top 21 names still spell out the Marblecake sentence. Time knows it was pwned by 4Chan, but simply throws up its hands. Time.com’s managing editor Josh Tyrangiel tries to defuse criticism by admitting that the poll is meaningless. He says, “I would remind anyone who doubts the results that this is an Internet poll. Doubting the results is kind of the point.” Or maybe the point is to name an Internet celebrity and create a controversy so that people click through to read the results. Well played.